London, Thomas Bowles & Emanuel Bowen, 1720. 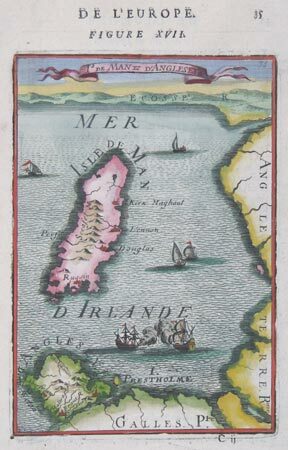 Miniature map of the Isle of Wight, Isle of Man, Jersey, Guernsey, Alderney and the Scilly Isles, from the first issue of 'Britannia Depicta', within a decorative border. On verso is a road map showing Shresbury and Welshpool. London, Roger Rea, 1666. The so-called 'miniature Speed' map of Holy Island, Farne, Guernsey, Jersey. Printed the year of the Great Fire of London, with an English text on verso. Amsterdam, Schenk & Valk, c.1700. 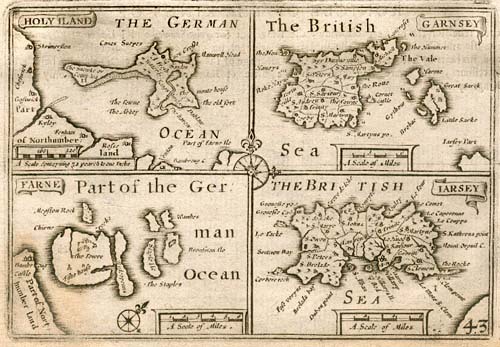 Four maps on one sheet, showing Jersey, Guernsey, Farne & Holy Island. Paris, c.1705. Normandy and the Channel Islands, with a decorative title cartouche. With a sheet of engraved text. London, P.Brooks & R.Sayer, c.1770. 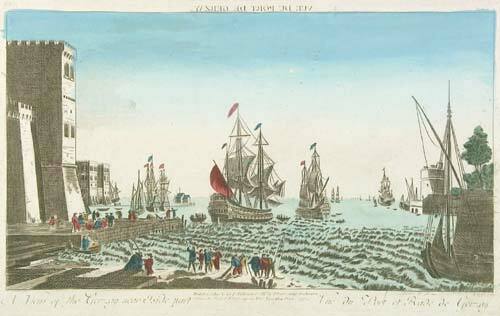 A 'vüe d'optique', probably of St Helier in Jersey, designed to be viewed through an optical viewer called a 'zograscope'. Originally engraved in Paris the plate had been bought by London publishers and re-issued, accounting for the appalling English title. Miniature Map of the Isle of Man and Anglesey. Paris, 1683. The Isle of Man and Anglesey. London: Grose, 1787. 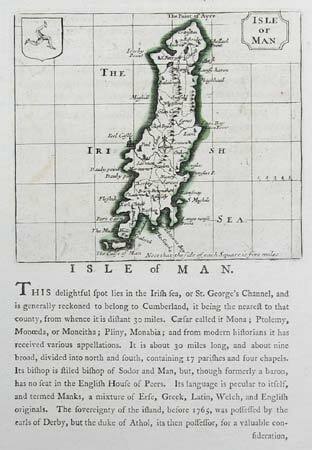 Map of the Isle of Wight, with text underneath and on verso.